Last year my in-laws moved from Vermont to Massena, on the northern edge of New York State, where the St. Lawrence River defines the border between the U.S. and Canada. Massena is very much an industrial town, with two Alcoa plants, a G.M. powertrain plant, and a large hydroelectric dam. I don't doubt that, during the Cold War, Massenans bragged about their prominence on the Soviet target list. 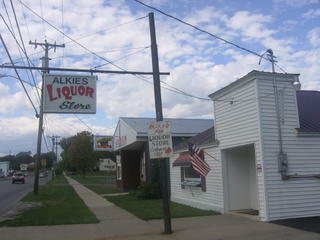 Massena does still have some little shops with charm, and sometimes charming names, like Alkie’s Liquor Store, where I was able to find a bottle of quite good, and inexpensive, V.S.O.P. Cognac. The proprietor told me she usually charged fifty dollars for a photo, but waived it for me because I bought a bottle, and I promised to publish the picture on my blog. 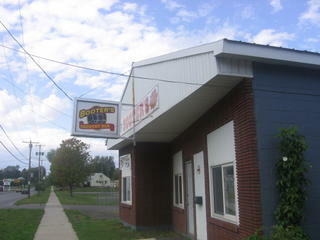 Here’s Alkie’s next-door neighbor, Booter’s Country Bar. Later in the afternoon, I rode with my step-father in law to a nearby farm stand to buy what proved at dinner to be remarkably tasty corn and tomatoes. On our way, we had to drive through a brief but heavy rain shower that, mercifully, stopped just before we got to the farm. On the way back, I regretted not having my camera, but rushed to get it as soon as we got home. I summoned my daughter outside, we both took shots, and Liz got the better one of this symbol of hope in a time of flood and tribulation. 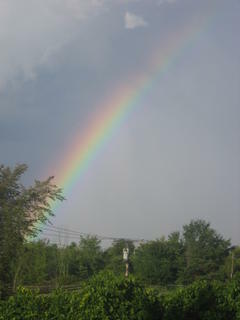 Keepin’ my eye on the Massena rainbow (apologies to John Stewart). For a gripping account of riding out the storm, and continuing updates, with photographs, from the Gulf coast of Mississippi, go to http://dancingwithkatrina.blogspot.com. The fact that the engine that creates my profile chooses to take my birthdate and, from it, determine and show my (Greek) astrological (sun) sign, and my (Chinese) zodiac year, which data I cannot delete from my profile without also deleting my age (which I choose to show), should not be construed as an endorsement by me of any system of astrology. A city that I love lies mostly deserted and gravely wounded. No speculation or pontification here. I'll do what I can for relief efforts, and hope you do, too. Here begins our adventure in blogging. If you know me from the Fray, or from some other context, you pretty much know what to expect. I've nothing more to say for now, except thanks for looking in, and please check in again soon. Any suggested topics for discussion are welcome. I hope to be posting some stuff for the Fray writers' group here soon. That will be clearly marked as such. Your comments are also eagerly awaited on anything else I post here.